Snacking is an important part of your meal plan. It helps you control hunger and can help you meet your nutrient needs. Vegetables make a healthy snack choice because they are low in calories and high in fiber. However, many dried vegetable chips may not be as healthy a snack choice as its source vegetable, but it would be better than a traditional potato chip. There are a number of different brands of dried vegetable chips, all with different ingredients. 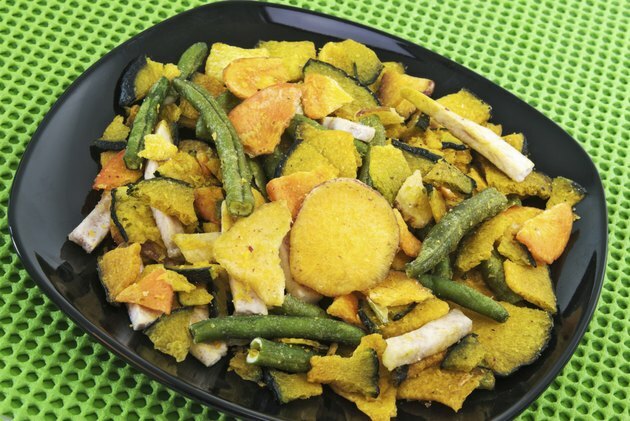 Nuts Online features a bulk dried vegetable chip that includes sweet potatoes, squash, carrots, green beans, taro and blue sweet potato. The chips are fried in non-hydrogenated canola oil and include added dextrin and salt. Dextrin is a type of carbohydrate that helps adhere the salt to the chip. Serving sizes are standardized to help you compare similar products, according to the Food and Drug Administration. One ounce is a typical serving size for chips. A 1-ounce serving of vegetable chips contains approximately 150 calories. In comparison, the same serving of Lay's potato chips also contains 150 calories, but they are higher in fat content. One serving of dried vegetable chips contains 6 grams of total fat and 1 gram of saturated fat. The American Heart Association recommends you limit your intake of saturated fat to less than 7 percent of total calories, or less than 15.5 grams on a 2,000-calorie diet. Because the vegetable chips are made with non-hydrogenated canola oil, they have an overall low saturated fat content, which is 1 gram. Each 1 ounce serving of dried vegetable chips contains 17 grams of carbohydrates, 3 grams of fiber, 5 grams of sugar and 1 gram of protein. Including more fiber in your diet can help improve digestion and satisfy hunger. Healthy women need 21 to 25 grams of fiber per day and healthy men need 30 to 38 grams of fiber per day. Fiber also helps regulate your digestive system, lower your cholesterol, control blood sugar and prevent weight gain, according to the American Diabetes Association. Each 1 ounce serving of dried vegetable chips contains 75 grams of sodium. In comparison, a 1 ounce serving of regular Lay's potato chips contains 180 milligrams of sodium. High intakes of sodium causes your body to retain fluids, increasing your blood pressure and your risk of heart attack and stroke. The U.S. Department of Agriculture recommends you limit your intake of sodium to 1,500 to 2,300 mg a day.